And sometimes, you don’t want to buy just any home — you want to buy that home. For any number of reasons, you often find a home you really like and want above all others. Trevor and Lindsay O’Keefe can relate to that. They wanted one particular home and they were able to purchase it with the Unison HomeBuyer program. But they also wanted to remodel the home and keep their monthly finances stress-free. Here’s how they did it. For Trevor and Lindsay, being a part of their community is a big deal. Trevor is a pastor, and as you would expect, his church and the congregation are very important to him and his wife. The couple have been at the same church for many years, and have developed many long-lasting connections with people there. With their children still young and being involved in the church as well, the entire family has strong ties to their community. While they already had a great life, the family had been living in a condo for years and were starting to feel ready to move into a more traditional home. They wanted a yard where their kids could play – and more living space than their condo. Their situation was slightly unique because he had a chance to purchase a home that had been in Lindsay’s family for decades. Her great grandfather had unfortunately passed away the previous summer, leaving the home empty. Trevor and Lindsay lived nearby. After Lindsay’s family suggested that they purchase the home, they seriously considered it and decided they loved the idea. It would allow them to raise their kids in a spacious home in a nice neighborhood — with a yard — and in a very special home with a long family history. But they weren’t sure about the financing, primarily because of certain home improvements that would be necessary and because of the required down payment. Trevor and Lindsay reached out to their loan officer, Michael Lowitz. After reviewing the proposed transaction details, Michael suggested that they contact Unison to learn about the Unison HomeBuyer program. Unison helps families achieve their home ownership goals by providing part of the required down payment. They realized that Unison could help them purchase the home without taking a loan from family members for the down payment. And their monthly housing payments would still be affordable, because the money Unison contributes is not a loan, so the buyer makes no monthly payments to Unison. With Unison, they would have the financial flexibility they needed to make necessary home improvements and still be stress-free. The couple applied with Unison and found the process very easy and straightforward. Unison asked them to review the terms of the agreement very carefully and to read educational materials about the program very thoroughly before signing the contract. “I appreciate so much that Unison was so thorough with the way they educate customers so that they know exactly what they’re getting into beforehand,” Trevor said. Once they understood how the program worked, Trevor and Lindsay felt it was very fair. “I think the fact that it’s not something that is added to our monthly expenses is wonderful,” Trevor said. Once the funding was in place, the home was purchased and it was time to move in. Trevor, Lindsay, and their kids couldn’t have been happier. The home has allowed them to have the kind of lifestyle they wanted while maintaining ties to their community. They can easily take walks around the neighborhood and the kids can play in the backyard or at nearby parks. Trevor even has a shorter commute now. 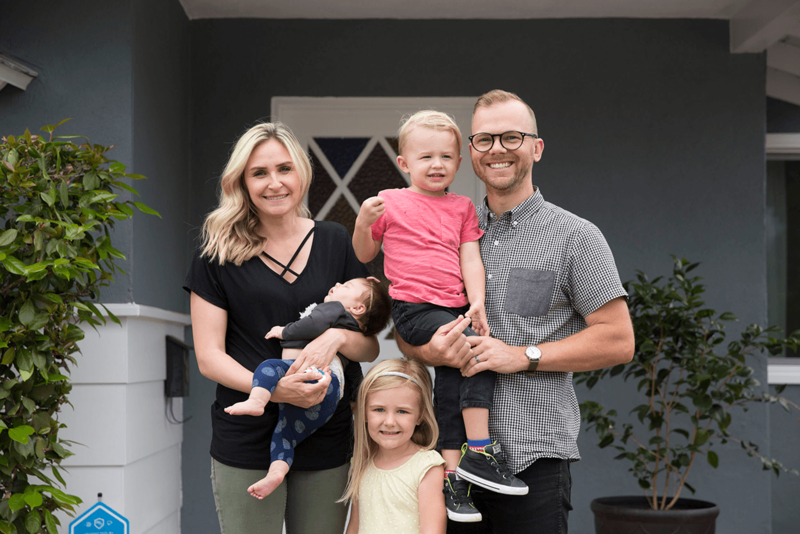 With the extra financial flexibility that the Unison HomeBuyer program gave them, they were also able to complete the remodels they wanted on the home. So now it’s exactly how they hoped it would be. Congratulations to Trevor and Lindsay on finding the home of their dreams and making it a reality. We wish them all the best!